Ultimate Calendar is easy to use portable calendar tool with rich features and settings. These are its main characteristics: Calendar for any year from 1 to 9999-th in table and list. Common and personal dates differing by sets and groups. Movable, recurring, periodical, particular dates. Internal editor for easy work with dates sets. Two view modes: Whole year and Monthly. 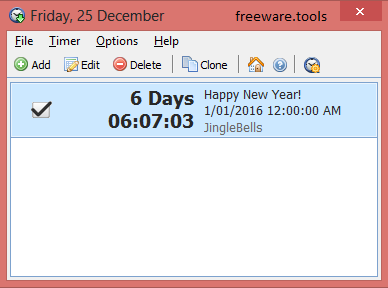 Popup window which contains the list of nearest events and displayed when the mouse hovers over the tray icon. Moving weekend days. Tracking change of day. No installation is required to use this tool. Ultimate Calendar Portable is an easy to use application functioning as a monthly as well as yearly calendar, that offers a rich set of features to help you better plan your daily activities. The application provides you with predefined date sets containing the important holidays and events in various countries, such as Austria, Belgium, Canada, France, Germany, Italy, Russia or the USA. It allows you to always know what national festivity is coming next. In addition, you can enter your comments next to each event that has relevance for you personally. From the context menu of Ultimate Calendar Portable, you can add various notes, personal events or celebrations, on specific dates in the calendar, preventing you from forgetting a birthday or an important project deadline. In addition, you can assign a priority level to each entry, so as not to miss important events, but still be able to postpone the less urgent ones. You can also use this feature to remind yourself of due bills for instance, by leaving messages a few days prior to the payment date. The calendar can be displayed in two different view modes: 'Monthly' and 'Yearly', the former allowing you to know of any upcoming event, without taking up too much space on your desktop. The latter enables you view the entire year's plan, getting a full picture of the scheduled events. Another interesting feature of Ultimate Calendar Portable are the two plugins provided by the application. The 'Sun and Moon' component enables you to know beforehand of the rising and setting hours for the Sun and the Moon. It also offers information concerning the length of the day, as well as the current lunar phase. The 'Julian dates' plugin lets you know what is the date in accordance to the Julian calendar. Ultimate Calendar Portable is a great personal planning tool, that offers useful information concerning national holidays, helping you better manage your busy schedule.